So it had been three week's since WWE's last Pay-Per-View offering Night of Champions had left some feeling a little disappointed, and heading into Battleground, I can't say that my hopes for the show were particularly high, I'm not sure why but the card just didn't catch my attention. So let's see how it actually went, shall we? We kick off the show with the usual video package detailing the main feuds heading into the show and what to expect in the course of the three hours. As usual, this was very well produced with some nice graphics and the key moments in the feuds between Randy Orton and Daniel Bryan, The Shield and The Rhodes Family, and CM Punk and Ryback. I thought it strange that they chose not to show anything from Alberto Del Rio's feud with Rob Van Dam, with that showing just how far the World Heavyweight Championship has fallen in prestige over the past year or so. This match was a lot of fun to watch from start to finish, and certainly the best match that Van Dam and Del Rio have had on television over the last two and a half months. In terms of actual wrestling there wasn't a whole deal, but that's not what this match called for. What we did get was a succession of spots that built as the match went on, with both men bringing all they had to the contest. With a steel chair, a ladder and steel bin to play with, Del Rio and Van Dam created a spectacle that drew me in almost straight away, from Van Dam's early moonsault off the barricade to Van Dam missing a Rolling Thunder onto a Ladder, there was a lot to like about this brawling contest. What the earlier part of the bout missed in terms of storytelling, the later stages pilled on, with Ricardo Rodriguez saving Van Dam from a Cross Armbreaker with a tiny bucket, before a well worked confrontation between Rodriguez and former best friend Del Rio, leading to Del Rio taking out Rodriguez by sending him into the barricade. The finish was also very well worked, after Van Dam had missed a Van Terminator, a series of attacks from Del Rio meant that Van Dam's arm ended up trapped in between a steel chair, allowing Del Rio to lock in the Cross Arm Breaker and pick up the submission victory and retain the World Heavyweight Championship. A very strong opening contest, and if we're to believe the dirtsheets Van Dam's last for a while for WWE. Winner and Still World Heavyweight Champion: ALBERTO DEL RIO! After the bout we headed to the backstage area, where The Real Americans had something to say. Zeb Colter did the majority of the talking, cutting a promo on Buffalo, New York, the location of Battleground, in his usual style, claiming there were too many Canadians in Buffalo. It was enjoyable, if not a little repetitive, with Colter winding things up by talking about The Real Americans opponents The Great Khali and Santino Marella, doing a good job of papering the cracks over what is clearly a filler match on the show. Whilst this may have been mere filler, this comedy tag team match was an entertaining couple of minutes. With solid tag team psychology, alongside comedic spots involving Hornswoggle with his own version of The Cobra, as well as some decent team work from The Real Americans, this bout surpassed my expectations by quite some way. The cleverest move made in this one was to keep Great Khali out of the match until the very end, he might not be able to have lenghty technical classics, but when used as an impact player he can be fairly effective and I'm warming to his partnership with Marella, who I think is extremely underated for what he does in the ring. The finish saw Antonio Cesaro managed to execute the Cesaro Swing on Khali and in terms of visual displays of strength, this was the most impressive thing I've seen in WWE for quite some time, as Cesaro went straight for the pinfall victory after the swing. For what it was this contest was decent tag team bout, but will most likely be forgotten pretty quickly. They ran the Rise Above Cancer video featuring John Cena, CM Punk, The Bella Twins, Alicia Fox and Layla, before showing Cancer survivors in the arena. Say what you want about WWE, but the work they are doing for Susan G. Kommen is fantastic, and hopefully is raising a lot of money for the foundation and continuing to raise awareness. I honestly couldn't make myself care about this match, and I tried pretty hard to. The action itself was decent, and it would be difficult to fault what was going on in the ring, but there was just no story to the action, and it was clearly hurriedly put together over the last week of television. R-Truth just seemed like such a random choice to face Axel, after months of irregular appearances on television, and losing most his bouts when he did appear, I had no emotional investment behind his character, so when Axel was beating him down for most of the match, I simply wasn't interested. The finish saw Axel dodge a Little Jimmy attempt from Truth by holding onto the ropes, before hitting a Hangman's Facebuster to pick up the pinfall victory and retain the Intercontinental Championship. Axel risks getting lost in the mix of Paul Heyman guys at the moment, with the focus clearly on Ryback, so it made sense to give him a clean victory here, I'd like to see Axel move into a feud of his own soon, with someone the audience is actually invested in, with recent attempt with The Miz and Truth falling flat. Winner and still Intercontinental Champion: CURTIS AXEL! They went on to do a quick recap of Dolph Ziggler's victory over World Heavyweight Championship Money in the Bank holder Damien Sandow from Battleground Kick Off, luckily the only showed the finish, which was the only real positive from that bout. I was pretty surprised with this bout, as for the most part it was an enjoyable contest, with some decent wrestling action, with Brie Bella needing to be commended for a spot that saw her collide with the ringpost and fall off the apron to the floor. I'm still not won over by Bella, especially as a face, and the decision to have Lee in control for most of the match was a wise one, as Bella's wrestling ability still isn't quite up to scratch, as a botched roll up attempt showed. The finish saw Brie get distracted by Tamina Snuka attacking Nikki at ringside, allowing Lee to get a roll up for a pinfall victory and to retain the Diva's Championship. It was certainly a wise decision to keep the title on the most popular woman the company has, but with it not looking like this feud is over just yet, I wouldn't be surprised if the butterfly is around the tiny waste of Brie Bella sooner rather than later. After Michael Cole had introduced a superb video package on the feuds between the Rhodes Family and The McMahon's we headed backstage to Renee Young who interviewed Dusty Rhodes, Goldust & Cody Rhodes. All three men produced excellent promos, that did a fantastic job of getting me pumped up for the tag team contest to come. I don't know what's happened to Cody Rhodes, but this whole feud seems to have lit a fire underneath him, and an average promo guy has become a top notch promo guy in the space of about two months. If WWE don't run with this and continue to build Cody into the main event star he deserves to be then they are complete fool. Out of everything that was booked for this show, this was the bout that I was most excited about heading into the event, it had been built up very well over the past few months, and it was easy to get emotionally invested in the Rhodes families story. Luckily, this one did not disappoint as Goldust, Cody Rhodes, Seth Rollins and Roman Reigns put on a quality tag team bout with a lot of twists and turns along the way. The build up to two separate hot tags was done very well, with The Shield working over their opponent effectively in their usual manner, Rhodes' moonsault for the first hot tag, especially stood out for me. I thought the finish was strong as well, getting everyone involved, with the feel good moment of Dusty Rhodes' fighting off Dean Ambrose with a belt, before Goldust saved his father from Roman Reigns, building into a nice false finish as Rollins attempted to steal a school boy roll up pin on Cody for a two count, before Rhodes managed to hit Cross Rhodes to pick up a pinfall victory and win his and Goldust's jobs back. Good storytelling, good wrestling, it's difficult to pick fault with this bout and it'll be great to see what WWE do with Goldust and Cody going forward. The moment when a number of WWE legends and wrestlers came out to congratulate the Rhodes family was just the icing on the cake here. They ran a promo for WWE's next Pay-Per-View, Hell in a Cell, which features the bizarre choice of R-Truth talking about the Hell in a Cell match, along side a number of clips from more recent Hell in a Cell matches. It was then back over to Josh Matthews and his Battleground panel of The Miz, Titus O'Neil and Tensai, as they ran down what had happened so far. 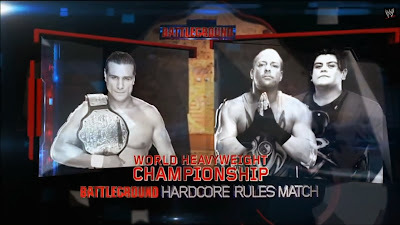 As with Battleground Kick Off it was another painful experience, as most of the panel seemed unaware of what had actually been happening on the show, with O'Neil even claiming Rob Van Dam had won the World Heavyweight Championship. These guys need to be clear what they are going to say, otherwise it just looks a complete mess. Backstage Raw General Manager Brad Maddox looked tired as he spoke to Stephanie McMahon on over the phone. With Smackdown General Manager Vickie Guerrero also turning up, it was revealed that McMahon and Triple H had left the building, and that Maddox was in control of the show. Maddox is doing a great job of playing the out of his depth underling, and it's difficult not to feel sorry for the guy, especially when the unlikeable Guerrero laughs in his face. This bout struggled to get crowd support early on, and I have to say that I found it difficult to buy into this one at the beginning, because not only did it seem like it was going to be a straight up squash match, it had been so poorly built up with a week of loose storyline that I really had no reason to care. However, the action was strong here, especially once Kingston got some momentum going and it began to look like he could be able to pull of an upset victory, with the crowd slowly warming to the action, with a springboard flip to the outside from Kingston onto the entire Wyatt Family being a highlight of the bout. I also thought the finish here was good, being worked at a decent pace with a number of reversals before Wyatt managed to hit Sister Abigail to pick up the pinfall victory. For such a poorly built up contest, Kingston and Wyatt did a great job in under nine minutes. After the bout, Erick Rowan and Luke Harper continued the punishment on Kingston with a series of devastating moves, finished by a Discus Clothesline from Harper. Wyatt went on to cut a promo in his usual bizarre style, talking about purity and the concepts of right and wrong. I was half expecting Kane to make his return here, but it looks like we're going to have to wait a bit longer for the Big Red Monster to get his revenge. Triple H's new DVD Thy Kingdom Come got a nice plug, as they played the advert for the DVD and Blu Ray set, which we'll hopefully have a review of very soon. It's available to preorder from www.wwedvd.co.uk, if you're interested in that one. They replayed Antonio Cesaro's Giant Swing on The Great Khali from earlier on, I suspect that one is going to replayed a lot. PUSH CESARO DAMMIT! With Michael Cole thanks Fall Out Boy for the Battleground theme song, “The Mighty Fall”, which had been playing all night long. I'm kind of mixed on this bout, there were bits that worked really well, but it just wasn't particularly exciting. When in control Ryback looks really good, and Punk makes you believe that he is getting hurt, but it was when Punk was in control that this match fell apart for me. Ryback just looked so wooden and stiff that things didn't look to be effectining him, no matter what Punk tried to do, and I don't think that was the effect they were going for, this wasn't Ryback no selling, it was Ryback not being able to sell. The storyline elements of this were fun and made sense, like Heyman causing Punk to get distracted by getting on the microphone, allowing Ryback into the match. The finish felt incredibly old school, with Heyman about to deliver a Singapore Cane shot to Punk, only for referee Mike Chioda to spot what Heyman was doing, while Chioda admonished Heyman, Ryback tried to take advantage but Punk was too clever hitting Ryback with a low blow and picking up the pinfall victory. This was a victory that Punk needed after a few consecutive losses in big matches, whilst Ryback was kept looking strong by the finish, with the storyline looking to continue for a while longer yet. Ah remember folks, DON'T TRY THIS AT HOME! Back on the Battleground Panel, they wisely ignored The Miz and Titus O'Neil, with only Tensai allowed to speak this time, with some good words on Punk and Ryback match, before they headed into talking about the main event that was still to come between Randy Orton and Daniel Bryan for the vacant WWE Championship, with some inane babbling from Miz and O'Neil, before Tensai got his fake beard out again and tried to get the crowd going with a “YES!” chant that was slightly more successful than the first time he attempted it. Hmmm, I'm going to go straight to the finish of this one, because no matter how good the rest of the match was (and it was very good), it feels pretty pointless when it was all just leading to this finish. Basically, after a blistering sequence between Orton and Bryan with a number of pinning variations, Bryan managed to lock in the Yes Lock and it looked like he might have the match won. With the crowd going crazy, the Big Show's music hit and out came the World Largest Athlete, pulling Mike Chioda out of the ring and nailing Bryan with the Knock Out Punch. With Brad Maddox sending down fired referee Scott Armstrong to make the count as Orton pinned Bryan, Show finally snapped pulling Armstrong out of the ring before the three count, and knocking him out, followed by a short confrontation with Orton, before Big Show knocked him out as well, to finish the Pay-Per-View. It was another what just happened moment, and one WWE couldn't really afford after the dodgy ending of Night of Champions. They managed to make the most popular guy in the company look like an afterthought, which is just crazy to me. Whilst, I'll admit it was good to see Big Show finally snap against the corporate chains he has been in over the last few months, this was not the place to do so and ended the Pay-Per-View on a sour note. I must stress that what Bryan and Orton did was very enjoyable and looked to be leading to quality main event, as an ending like that makes it hard to remember what had gone on before. It was clear that WWE was attempted to use the finish to gain more viewers for the next nights Raw, but you have to make sure that people who have paid for the show get a satisfying and complete ending first, before trying to do that. Overall, Battleground wasn't the best pay-per-view WWE has produced this year, with a lot of rushed together filler bouts and a disappointing finish to the show. However, their was still some good stuff going on, most notably Cody Rhodes and Goldust's bout with The Shield's Roman Reigns and Seth Rollins, and a few matches that surpassed my expectations. Hopefully, WWE will see a true return to form in three weeks time for Hell in a Cell.